When Elie Wiesel died in July 2016, the White House issued a memorial statement in which President Barack Obama called him “the conscience of the world.” The whole of the president’s eloquent tribute will appear as a foreword to this memorial edition of Night. “Like millions of admirers, I first came to know Elie through his account of the horror he endured during the Holocaust simply because he was Jewish,” wrote the president. In 1986, when Wiesel received the Nobel Peace Prize, the Norwegian Nobel Committee wrote, “Elie Wiesel was rescued from the ashes of Auschwitz after storm and fire had ravaged his life. In time he realized that his life could have purpose: that he was to be a witness, the one who would pass on the account of what had happened so that the dead would not have died in vain and so the living could learn.” Night, which has sold millions of copies around the world, is the very embodiment of that conviction. It is written in simple, understated language, yet it is emotionally devastating, never to be forgotten. Born in the town of Sighet, Transylvania, Wiesel was a teenager when he and his family were deported to Auschwitz and then Buchenwald. Night is the shattering record of his memories of the death of his mother, father, and little sister, Tsipora; the death of his own innocence; and his despair as a deeply observant Jew confronting the absolute evil of man. “Never shall I forget that night, the first night in camp, that turned my life into one long night,” writes Wiesel. “Never shall I forget . . . even were I condemned to live as long as God Himself.” These words are etched into the wall of the Holocaust Memorial Museum in Washington. Far more than a chronicle of the sadistic realm of the camps, Night also addresses many of the philosophical and personal questions implicit in any serious consideration of the Holocaust. 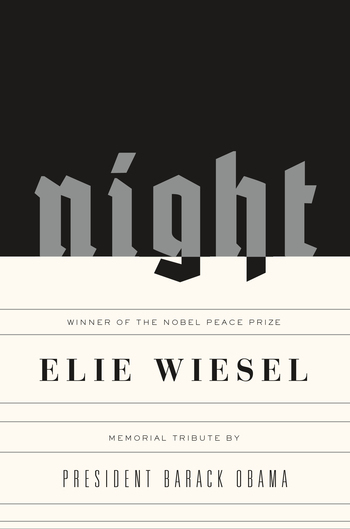 The memorial edition of Night includes the unpublished text of a speech that Wiesel delivered before the United Nations General Assembly on the sixtieth anniversary of the liberation of Auschwitz entitled “Will the World Ever Know.” These remarks powerfully resonate with Night and with subsequent acts of genocide. Elie Wiesel (1928–2016) is the author of more than sixty books. Night, first published in Yiddish in 1955, was selected for Oprah’s Book Club in 2006, and continues to be an important reminder of man’s capacity for evil. For his literary and human rights activities, he has received numerous awards, including the Presidential Medal of Freedom, the U.S. Congressional Gold Medal, and the National Humanities Medal. He received the Nobel Peace Prize in 1986.